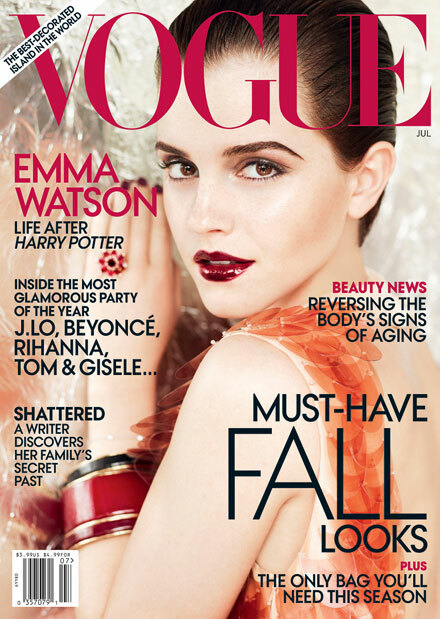 Beautiful Emma Watson revamps her look for the Vogue July 2011 cover spread. Photographed by famed Mario Testino, wearing designer clothes and bold make up, Emma talks about her life during and after the Harry Potter franchise, education, love and dating, new projects, fashion, and finding her place in life. What I love about this girl is that she’s completely honest and sincere. Besides, Emma Watson is very smart, especially if compare to other Hollywood starlets. I love Emma Watson! She is gorgeous and has definitely grown up since her Harry Potter younger years. I’m so happy that she’s on the July 2011 issue! Cannot wait to pick it up!